The good news for the week is that Joe Hill's amazing book NOS4A2 has been picked up by AMC! It will be a 10 episode series that is set to launch next year. If all goes well for this and the Locke and Key series it is a great time for horror fans. Super pumped about this. 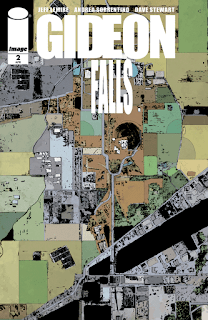 Gideon Falls #2 - I am enjoying this series from Jeff Lemire, Andrea Sorrentino and Dave Stewart quite a bit and hope that the payoff is worth it when we finally learn more about the Black Barn. Norton, the strange man who is collecting pieces of the Black Barn from the trash around Gideon Falls, is currently in therapy and things don't seem to be going well. He is obsessed with the Black Barn and finally tells Dr. Xu. Meanwhile, Father Fred finds himself as a person of interest in a murder and is convinced that the individual he moved to Gideon Falls to replace is behind it. His alibi doesn't check out as that individual supposedly drowned last week. This book is extremely suspenseful and the Black Barn and the evil forces are hopefully worth the intrigue that Lemire and company paint in these first two issues. The ending of this issue has me ready for the next one and I am very curious to learn more about who knows about the Black Barn and why it is important. The Bishop that sent Fred to Gideon Falls seems a likely suspect. 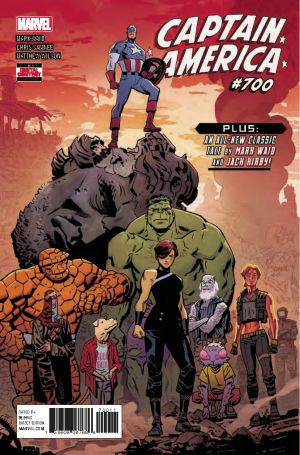 Captain America #700 - I revisited one of my favorite characters this week and learned a bit about what happened since I last read an issue. Captain America finds himself once again a man out of time, having been frozen and then awakened in 2025. Not as bad as the first time he was on ice, but I'm sure he would rather not time travel in this fashion. This issue has Captain America overwhelmed trying to save the U.S. as enemies from all over the world moved in after the collapse of who I am guessing is the president. The only option is to send Captain America back in time to prevent him from being frozen for so long. Definitely an interesting issue and since Mark Waid is writing once again on this book I might have to hop back on the wagon. 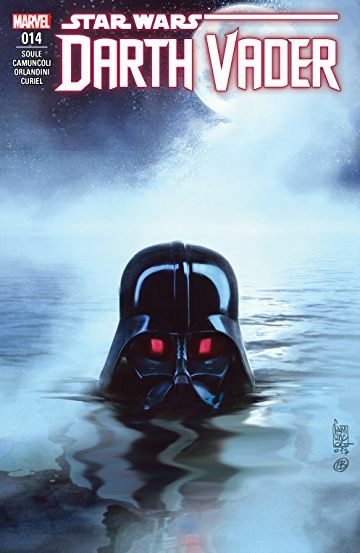 Darth Vader #14 - In what featured my favorite cover of the week, Vader is starting to overlap with the Star Wars series in a direct way and it is really interesting to see what is happening on Mon Cala while Leia and the rebels are on their mission. Vader knows that there are Jedi hiding on the planet and attempts to use brute force to convince the Mon Cala king to give him the intelligence he needs. Underestimating the tactics of the Mon Cala, Vader must feel like he is merely treading water when he realizes the mistake he made. Never underestimate the power of local wildlife and topography. Loved the ending of this book and how the Mon Cala fought back. 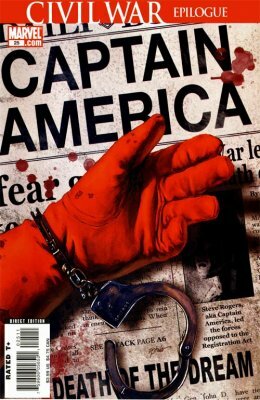 Captain America #25 - In honor of the 700th issue of Captain America, I revisited the story arc that turned me into a huge Captain America fan. Ed Brubaker, who is one of my favorite creators, penned the death of Steve Rogers and really fit the darker more serious tone he provided. The plot included Red Skull planning on transferring his consciousness into Sharon Carter's unborn child who is believed to be fathered by Cap. Toss in the mind games played by Doctor Faustus and the chilling scene on the courtroom stairs and you have an amazing issue that set up one of the best arcs, if not the best arc, that I have currently read.